Immigration Minister John McCallum offers praise and congratulations to everyone inside Canada and out who helped the federal government bring in 25,000 Syrian refugees, but warns there is much more to be done. "We are not having a massive celebration about this, because it's only a victory for Phase 1," McCallum told reporters gathered at Toronto Pearson International Airport today. The effort now will shift to Phase 2: helping settled refugees find permanent living arrangements, jobs and to get them enrolled into language training for either French or English. The government has managed to bring the 25,000 Syrian refugees into Canada "at a cost of a little over $700 million, and I can tell you we are under the budget that we set," McCallum said. "We did not spend the reserves that we had established." The minister did say, however, that the federal government would likely need additional funds to pay for the costs of language training, because many of the new arrivals do not speak French or English. This past weekend the government reached the 25,000 figure for settled refugees from Syria. That number included both government-sponsored and privately sponsored refugees. As of Feb. 27, private sponsors had brought in 8,527 Syrian refugees since the Liberals came to office. 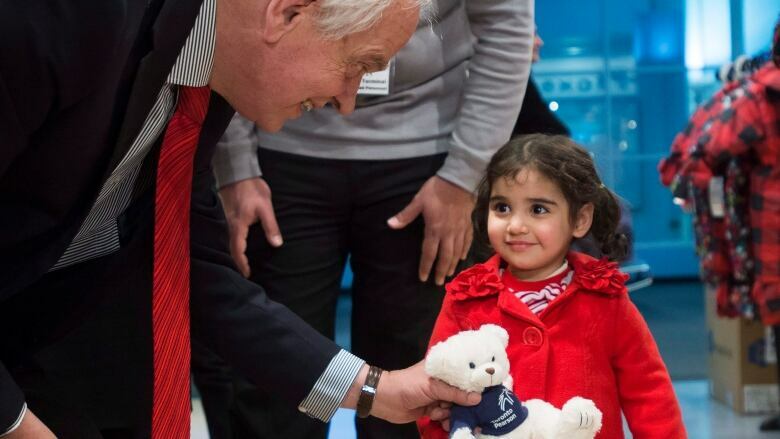 In order to meet the Liberal government's campaign promise of bringing in 25,000 government-sponsored refugees, McCallum said, the federal government will have to settle another 10,000 Syrian refugees, plus some additional private refugees, before the end of the year. 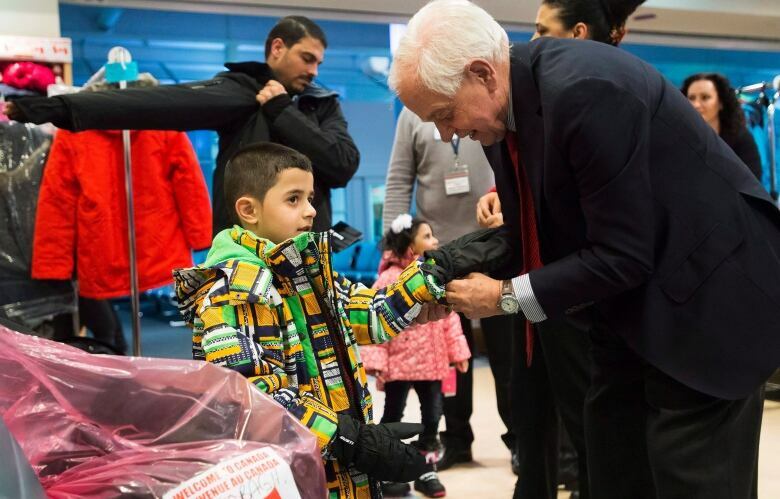 McCallum helps Syrian refugee Ramez with his glove at Pearson airport. McCallum said he would make an announcement in the next 10 days in Parliament to update the country on the exact number of refugees that Canadians can expect to see arrive before the end of 2016. The minister also took the opportunity to laud Canada for its efforts to welcome so many Syrian refugees at a time when they were being turned away from many other countries. "We were going in the opposite direction from many countries," he said. "Many countries from around the world today are making it more difficult for refugees to come,, and they are setting up more barriers, and we are among the few countries who are saying, 'No, come on in, we want to welcome 25,000 quickly.'" "It's important that we're sending a message to the world, it's important that we're helping 25,000 people from desperate conditions have a happy and productive life in Canada," he said. McCallum told reporters that since he has become the immigration minister, his No. 1 focus has been to meet his party's election promise on the Syrian refugees, but now that priority would change to processing times for people already in the immigration system. The minister said it was unacceptable that the average wait time for a husband and wife to be reunited was two years, and in some cases longer, and now that the refugee file was winding down he would make streamlining his department a new top priority. "I will be undertaking a very major effort to improve the efficiency with which my department processes people to remove unnecessary steps," McCallum said. "I am ashamed that we, a country who view ourselves as being open to newcomers, should take two years to bring together husband and wife and even longer to bring in parents and grandparents." The minister said his government learned a lot about how to be efficient through the Syrian refugee experience and is confident he can improve his department's waiting lists by applying the lessons learned there across his department.